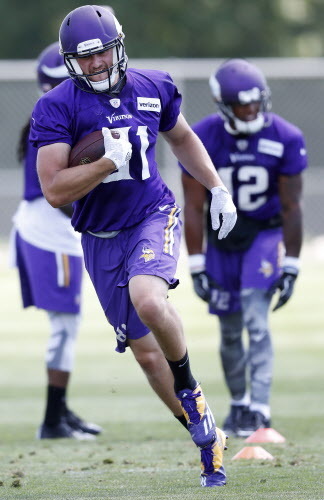 Moritz Böhringer, the German wide receiver who attracted international attention when the Vikings made him the first draft pick to go from Europe straight to the NFL, is back in the league. The NFL announced Böhringer will be one of eight international players on a practice squad throughout the 2018 as part of the International Player Pathway program, which gives eight teams an additional practice squad spot to carry an international player for the seasons. Teams in the NFC South, which started the program last year, will be allowed to bring back the same player they carried on their roster last season. Additionally, an AFC division was drawn at random for the opportunity to carry an international player this year; each AFC North team will have a player, and Böhringer will be with the Cincinnati Bengals this season. Minnesota became enamored enough with Böhringer’s size and speed to spend a sixth-round pick on the 6-foot-4 receiver in the 2016 draft, though Böhringer — who was used to running only a handful of plays with his teams in the German Football League — needed time to digest a NFL scheme while adjusting to the speed and physicality of the game. The Vikings released him at the end of training camp in 2017. Had the International Player Pathway program been around in 2016, it would have been interesting to see if the Vikings would still have drafted Böhringer. The league’s announcement of an extra practice squad spot came after the draft, and it’s unclear if the eight teams selected were aware before the draft whether they’d be getting an extra player. There were hints of a marketing strategy in the fact that Böhringer — who’d become a fan of American football after seeing highlights of Adrian Peterson — ended up in Minnesota at all, and if the Vikings had been given the opportunity to keep him on the practice squad with an extra spot, they might have used their pick in a different manner that year (though it’s always possible another team would have liked Böhringer enough to take a chance on him in the draft). In any case, he’ll return to the league this season, and the Bengals will see if he’s closer to taking the next step toward a spot on their active roster.